Bunnycup Embroidery is excited to introduce the Bunnycup Embroidery Loyalty Program. 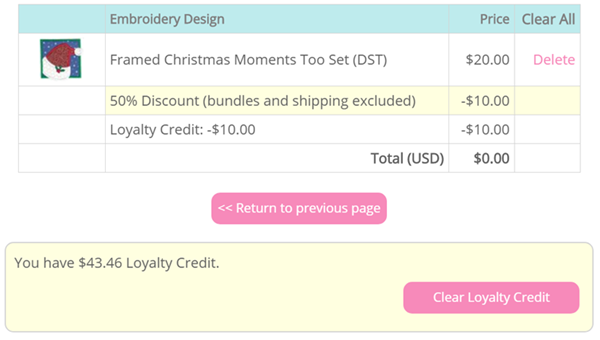 Now everytime you purchase from Bunnycup Embroidery you receive 10% back automatically! Everytime you buy from Bunnycup Embroidery your Club Bunnycup account (linked to your email address) will be automatically credited with 10% of your purchase price (excluding shipping). 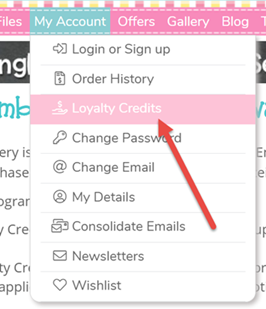 When you are logged into Club Bunnycup you can view your current Loyalty Credit balance at the top of every page (just below the Bunnycup Embroidery logo). To view all the detailed transactions and see how much each order has earned or where you have spent your Loyalty Credit go to Club Bunnycup or click the Loyalty Credit balance in the top of page link. Once you have earned your Loyalty Credits using them couldn't be easier! Simply add all your items to the cart (any special offers or discounts are automatically applied). Then click the button to add your Loyalty Credits. If you aren't logged into Club Bunnycup already you will be prompted to do so. If your cart is less than your Loyalty Credit balance then only the amount of credits required will be used. If your cart is more than your balance you simply pay the difference. What could be simpler than that?